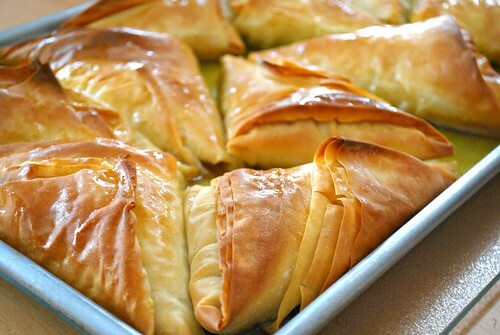 Now if you haven't worked with phyllo dough before, no worries! The great thing about phyllo dough is that it's very forgiving and there's nothing some melted butter can't fix. The best tip is to ensure you butter each layer used so that these bake up nice and golden brown while keeping the dough lightand crisp. 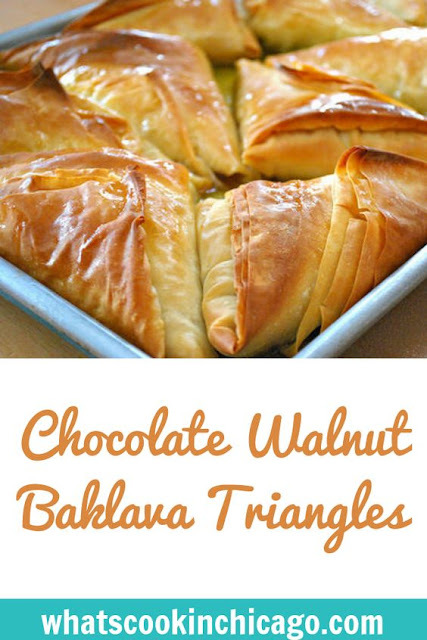 The chocolate and walnut filling will be a nice surprise once you take a bite - just be warned that it will be hot, so try to wait a few minutes for it to cool a bit. This is great to make in advance and pop in the oven for company. You can even prepare them and freeze for later too! Some variations include switching up the walnuts for pistachios or pecans. For a prettier presentation, drizzle some chocolate over the tops before serving! To make the filling: Combine all the filling ingredients in a bowl and set aside. To prepare the phyllo dough: Open the package and lay out phyllo in one big stack. Brush top layer with melted butter (or with PAM cooking spray if using); fold in half. Brush again with butter and fold in half again. Brush with butter and place a heaping tablespoon on the bottom corner. Fold the corner topped with filling towards the opposite side to create one side of the triangle; brush top with butter. Continue to fold the filling mixture to the opposite side to create the other side of the triangle; brush top with butter. Repeat folding and brushing top with butter until phyllo piece has been used. Process is very similar to folding a flag. with remaining phyllo dough and filling. When baking sheet/pan is full of chocolate walnut triangles ready for baking, place in preheated oven and bake for 20-25 minutes or until tops are golden brown. Remove from the oven. While the triangles are hot, pour the prepared syrup over the triangles and allow to cool, soaking the syrup in. Serve slightly warmed or cooled.